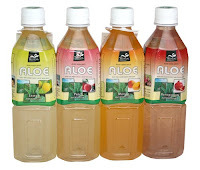 Here is another Aloe Vera beverage review, however this one is from another brand and as you can see the bottle looks very much like the other brands. Not sure why they all choose such and squared bottle design though. One thing very interesting about these bottles are that they are kind of vacuumed, when you put this bottle upside down you don't see any air bubbles. I didn't bought all flavors though the one missing is the normal Aloe Vera taste but I reckon that taste pretty much the same as the rest. But this brand got special mixed flavors from lemon, mango, peach and promenade. The taste of all are very good and actually taste better then other kinds of beverages with those taste. Actually the taste of the are close to the real fruit it self. The best ones for me is promenade and lemon. Actually can buy these daily and drink it with lunch or as a refreshment. Only thing is that you should like to the chunks of aloe vera floating in it, however for me it is not a big deal because the flavors are very good. The design side is still not that good compared to normal beverages, however it is better then the Aloe Vera King but not really that much. For me the looks of the label and bottle , looks allot like they are for sale at a garden shop ( as special aloe vera fertilizer water for lemon,peach,mango and promenade plants, that is how they looks like). The looks and design looks too much like garden products than any beverage, I think they need to hire a better designer for the labels or even for the bottle. 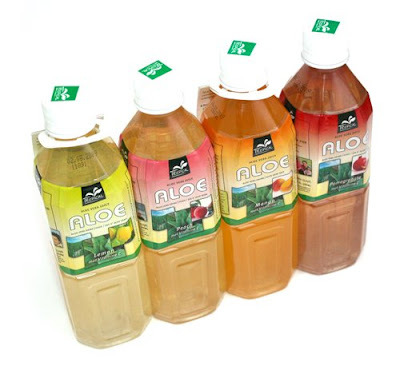 I think if I have any time I should make some concepts designs for aloe vera beverages and see if I could interest one of those companies with the design. I am sure even the simplest concept from me would still be much better then all those aloe vera bottles.